Late last year, I was part of the Philly Game Jam with some talented Philadelphia folks – Tatiana, Andrew, and Laura – at the Cipher Prime studios in Philadelphia! It was a lot of fun and we made a quick game called Evacuate Philadelphia which will be demoed at the next local IGDA meeting. It’s a little rough, but that is the nature of a game jam piece after all. I want to talk about something that made me pleased about this game. The topic of the jam was “Deconstructing Philly.” I immediately thought it might be fun to use real Philadelphia data from the Open Data Philly project in our game. So I started looking through the data sources for something that might make for an interesting game idea. One set of data available was the real evacuation routes for a disaster in Philly. 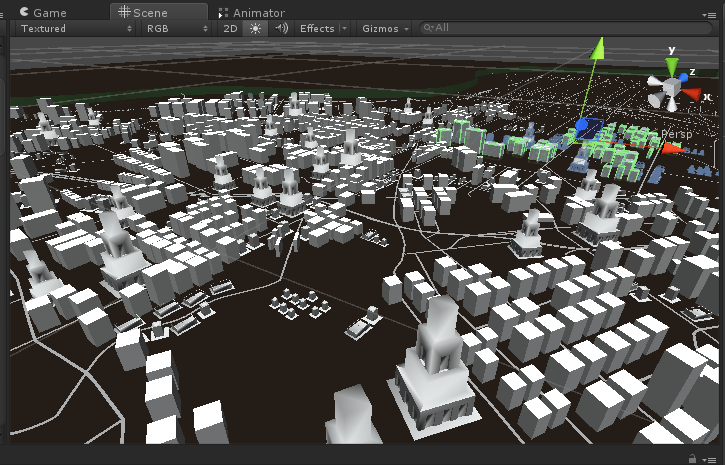 I thought it would be fun to do a game about evacuation and get that data in a game engine. Success! Real great-looking data! But that is not a game. So now what? 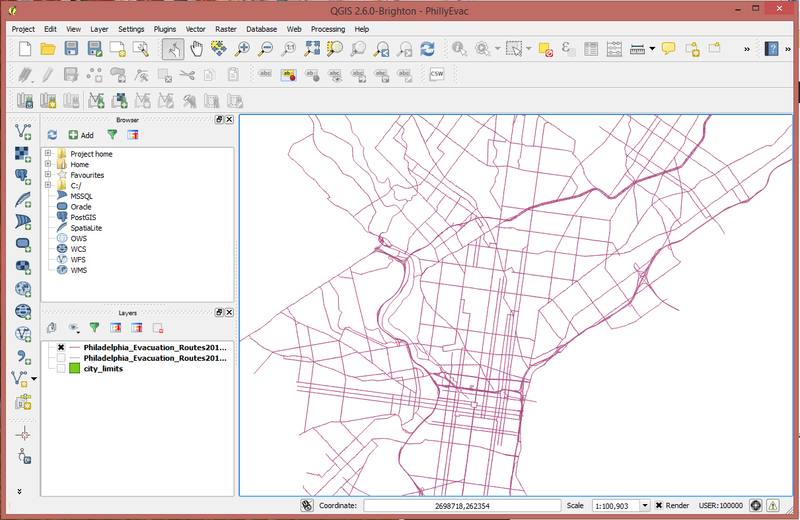 QGIS supports exporting the data as a DXF file. The .DXF is an AutoCAD format that can be read in Autodesk packages. So I export the DXF, and import that into 3D Studio Max. It’s on its way to being a game asset now. 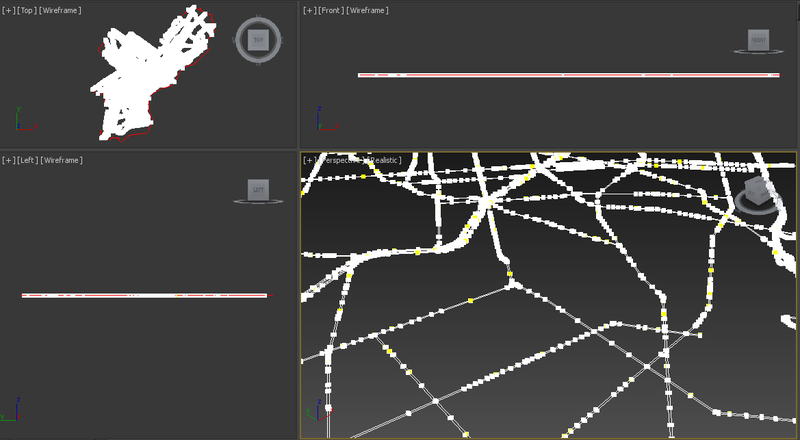 But there’s an issue: there’s so many points of data on the splines imported that 3D Studio Max is choking on it. If I click on the generated splines, you can see that there’s tons of points here. If converted to a polygon – which made Studio Max chug, and crash several times – it works out to about 3 million plus polys with untold triangles. That’s way too much data for a simple game, and a lot of it redundant, with lots of points on straightaways that aren’t necessary to define the shape of the object. 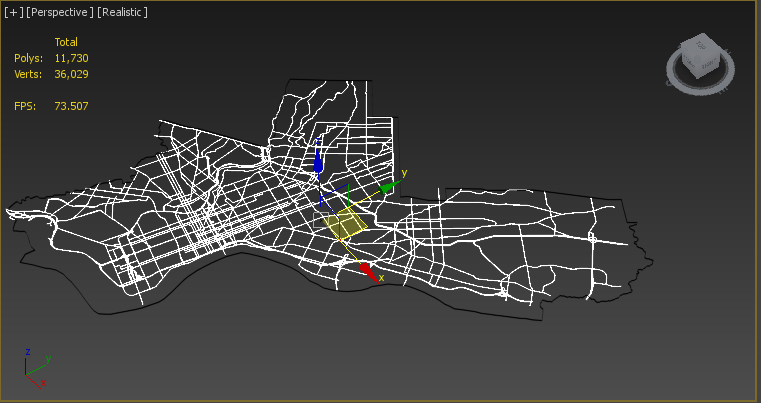 But it has to be converted into a polygon to get into the game engine at all, so I have to press on. Much better! Not perfect, but good for the boundaries of a game jam. And it looks like a real city! It’s small here, so click to see in all its glory. I was pretty proud of working out this process, so maybe it’ll be useful in your games and other hacks. Thanks to everyone at the Philly Game Jam this weekend for a fun time! Are you a beginner with Unity? Check out the Microsoft Virtual Academy course done by some of my friends at Microsoft for some starter files and another neat tutorial.